During the two-week intensive PDC (Permaculture Design Course) students cover a variety of topics from soil health and water conservation to plant families and crop rotation. Also, near the end of the course, we begin discussing the Permacultural views on finances and the economy and on the structure and organization of society. I found the idea of non-monetary exchanges particularly heart warming, and even though the concept of exchanging services for services or goods for goods without mixing up any kind of currency into it is not a new one…it’s one we often forget about in our money-fixated world. Couchsurfing is an excellent example of people helping people without involving money into the equation. 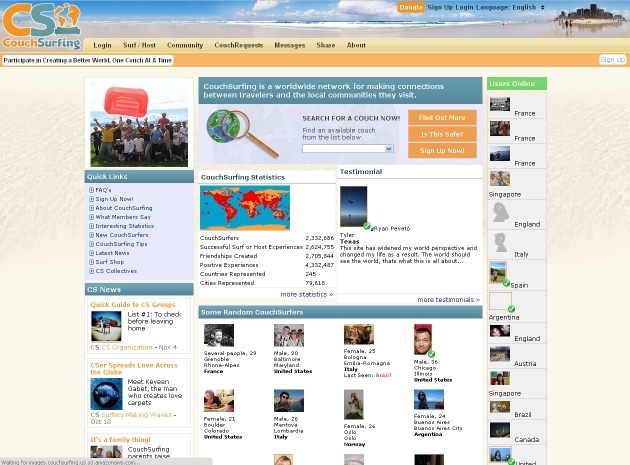 Basically, Couchsurfing (or CS for short) is a network of travel-minded folks who open up their homes to other travelers for a stay of anywhere from one night to several weeks and in exchange get to listen to their stories, practice a foreign language or simply enjoy their new friend’s company. A free make-friends-wherever-you-may-go scheme, and the invitee may bring a little token of appreciation from their home country too, if they so choose. Travelers get to benefit from a free roof over their heads and an opportunity to meet and exchange with real locals in foreign and exotic lands. Hosts are happy to help tired and often overhwhelmed travelers while also gaining positive references and experience on their profile which will help them get hosted in turn when they hit the road. Ofcourse hosting is not obligatory in order to surf, but many CSers appreciate members who partake in both and, obviously, positive references left on your page by surfers and CS friends boosts your chances of getting hosted yourself. I started CSing about a year and a half ago when I decided upon a last-minute trip to visit my boyfriend in Scotland when he was there for the British Open in St. Andrews. The golf tournament was a huge event and I couldn’t find any type of hotel, bed and breakfast or, it would seem, even a meager bridge to sleep under during my stay. I turned then to the locals, to the CS community, where I explained my story and asked to be helped in “reuniting an international couple”. Within a few hours, I was flooded with kind answers and welcomed into so many homes that I had to send more refusals than acceptances to potential hosts! I was humbled and overjoyed to find like-minded, kind and open people who were so willing to help out a complete stranger. My first stay in Scotland went very well and I’ve been hooked to CS ever since. Since that time I’ve hosted over a dozen travelers while living in Granada and surfed a few more times in Spain, France and again in Scotland. I’ve also made friends and met up with CSers which is an added bonus of belonging to this international community – it’s like having a local network of friends wherever you go in the world! References left by CSers for CSers as well as some simple ID and address checks make couchsurfing relatively safe, although using some caution and common sense when meeting and staying with strangers is always a wise move. Personally, I’ve never had an outright negative or unpleasant experience as a CSer although, predictably, you don’t necessarily hit it off and connect spiritually with every single person you meet. All in all though, through getting to know and mingling with the locals it has deepened my travel experiences, made life more interesting and enjoyable and, naturally, saved me a few bucks. First and foremost though it has helped me to regain some trust and faith in man kind (we aren’t all serial killers after all!) and confirmed my conviction that help and exchanges don’t always have to come with a price tag attached. Previous Post WWOOF – so what the heck is it anyways?